University of Chicago law students have borrowing privileges at all campus libraries, including Regenstein (social sciences and humanities), SSA (social work), and Crerar (science and medicine). A current validated UChicago Card is required for all charges. Most books, with the exception of materials on Reserve, are due on the Friday of the first week of the following quarter. For more information, please consult the D'Angelo Law Library Borrowing Policies page. The D'Angelo Law Library offers a service to retrieve and deliver uncharged Library materials located in the stacks of other libraries on campus. This service is available only to students at the Law School. Materials will generally be collected within two business days. Group study rooms are available for law students for course work or other academic projects. Reservations are limited to 4 hours per day per student. The D'Angelo Law Library has seven study rooms: two study rooms on each of the 4th, 5th and 6th floors, and one study room on the 2nd floor. Law students may reserve use of a conference room online using the Law School's room reservation system. You will need to log in using your CHICAGOLAW username and password. Reference librarians teach the legal research component of the first-year Bigelow program and also provide library workshops on selected topics throughout the year. D'Angelo Law Library reference librarians have produced a number of research guides to provide an overview of useful resources for a variety of legal topics. 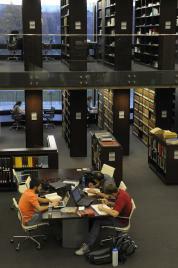 The University Library also provides research guides for a variety of non-law topics. If you would like further research assistance, you may contact a reference librarian.